Although parathyroid surgery can be rewarding for the otolaryngologist or head and neck surgeon, it also can be vexing. The vast majority of explorations proceed as planned, with rapid identification and removal of the abnormal gland. However, a particular case can be frustrating and beguiling if the number of glands is abnormal or inconsistent, if the pathologic abnormality lies in an anomalous location, or if the hyperparathyroidism is based on heredity factors. Normal parathyroid glands as seen during a thyroidectomy. The large arrow points to the superior parathyroid. The thinner arrow points to the inferior parathyroid. The forceps points toward the recurrent laryngeal nerve. The patient's head is toward the right. Parathyroid glands, “the last major organ to be recognized in man,” were discovered in 1880 by a Swedish medical student, Ivar Sandstrom. However, the first-ever reference to the parathyroid gland was made in 1850 by Sir Richard Owen during the postmortem examination of a rhinoceros that died prematurely at the London Zoo. Later, von Recklinghausen noted the relationship of the parathyroid glands to fibrocystic bone disease in 1891 (with the description of von Recklinghausen disease). Mandl reported the first successful removal of a parathyroid adenoma in 1925 in Vienna. The patient had bone pain, osteitis fibrosa cystica, and calcium sediment in the urine. The first reported removal of a parathyroid adenoma in the United States occurred in Massachusetts in 1926. The patient required 6 operations over 7 years until a substernal parathyroid adenoma was removed. Prior to 1932, all patients with hyperparathyroidism presented with osteitis fibrosa cystica. Before this relationship became clear, osteitis fibrosa cystica was thought to be a bone disease that caused parathyroid enlargement. In 1934, Albright noted that nearly 80% of patients with osteitis fibrosa cystica had either renal stones (nephrolithiasis) or nephrocalcinosis. For the subsequent 30 years, renal stones were considered the hallmark of hyperparathyroidism. Gout (due to hyperuricemia) and pseudogout (due to calcium phosphate crystals in the joints) were also commonly found. A relationship with peptic ulcer disease and pancreatitis was discovered in 1946. These early concepts and surgical cures led to a detailed knowledge of calcium metabolism, pathophysiology of parathyroid hormone (PTH) and its many systemic manifestations, and the role of renal disease in secondary hyperparathyroidism, which has been further refined. Advances in imaging and surgical technique have elevated the current level of expertise in the management of simple and complex cases of hyperparathyroidism. Hyperparathyroidism is a condition caused by excessive, inappropriate, and uncontrolled secretion of PTH by one or more parathyroid glands. Increased levels of PTH affect bone, the GI tract, and the kidneys, which causes elevation of the serum calcium level, generalized bone disease, decreased serum phosphorus levels. This occurs due to increased renal excretion and decreased reabsorption of calcium, and increased excretion of phosphorus. A variety of systemic conditions that involve various tissues result from changes in serum calcium and phosphorus levels. Skin, tendons, muscles, soft tissue, kidneys, eyes, nervous system, gut, and vascular systems can be involved. A single adenoma causes primary hyperparathyroidism in most patients (80-90%). Multiple adenomas can occur, and diffuse hyperplasia can develop in one or more glands. Secondary and tertiary hyperparathyroidism are observed in patients with chronic renal disease and represent different diagnostic and treatment challenges. Parathyroid carcinoma may occur in 0.1-1% of patients with hyperparathyroidism. Hereditary hyperparathyroidism requires additional knowledge of the mode of genetic transmission as well as the different pathophysiologies and treatment modalities required for these sometimes very difficult clinical conditions. The incidence of multigland disease is uncertain and varies based on the criteria used to define the condition. Certainly, a number of hereditary conditions can involve all parathyroid tissue. In nonhereditary conditions, the incidence can vary from 5-33%. A study at the University of Miami reported that during 4-gland exploration, 10% of cases had multigland disease based on size, but only 3% had multigland disease when hormone secretion was measured. 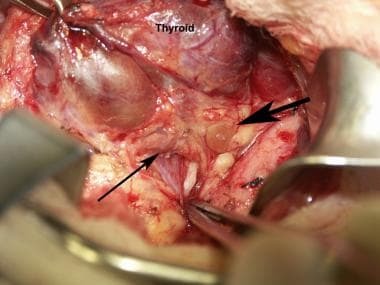 Surgical treatment of hyperparathyroidism requires a thorough understanding of the pathophysiology of the disease and the embryologic basis of parathyroid gland surgical anatomy. The number of glands in any individual may vary, and the surgical anatomy may be inconsistent. Ectopic and extra glands present special challenges to the surgeon during exploration for primary hyperparathyroid. Chronic renal disease adds an additional level of complexity to the management of hyperparathyroidism and requires close and careful collaboration with the treating nephrologist. Age-adjusted incidence of primary hyperparathyroidism was estimated to be 42 per 100,000 in an epidemiologic study in Minnesota over a 10-year period. Hyperparathyroidism is most common between the fifth and seventh decades of life; the incidence is known to increase in persons older than 50 years. Hyperparathyroidism is 2-4 times more common in women than in men and is rare in children. In selected older populations, the prevalence of the disease may be as high as 1 in 1000 to 1 in 200. Approximately 100,000 new cases of hyperparathyroidism are reported in the United States annually. The etiology of hyperparathyroidism in sporadic cases is unknown; however, hereditary aspects of the disease have been identified. Details of the disorders, related conditions, and treatment considerations are discussed below. In studies that screened for thyroid disease in patients with previous head and neck irradiation, the number of patients with primary hyperparathyroidism was found to be increased. As in thyroid disease, the latency period for the development of hyperparathyroidism ranges from 20-45 years after radiation is administered. Secondary hyperparathyroidism (better termed renal hyperparathyroidism) and tertiary hyperparathyroidism are seen in chronic renal insufficiency and represent, in part, a physiologic response to a lack of vitamin D. Renal conversion of vitamin D to its active form is reduced in persons with chronic renal failure. In addition, elevated serum phosphorus levels due to reduced renal function (lowered excretion of phosphorus) and lowered serum calcium levels further stimulate PTH production. Some dialysis solutions may contain little or no inorganic phosphate, which causes some phosphate loss during dialysis and a decline in serum phosphate levels. Serum hyperphosphatemia is a potent stimulus for PTH production in renal failure (PTH ordinarily increases phosphate secretion when renal function is not impaired) and results in diffuse parathyroid hyperplasia of renal hyperparathyroidism. Tertiary hyperparathyroidism  is a condition in which unregulated PTH is produced in persons with progressive renal disease after parathyroidectomy has been performed for renal hyperparathyroidism. Autonomous hypercalcemic hyperparathyroidism can develop following a period of hypocalcemia after parathyroidectomy. Although cases of sporadic hyperparathyroidism are idiopathic and the etiology remains unknown, heredity plays an important role in familial hyperparathyroid disorders. Identifying conditions caused by genetic conditions is extremely important since the treatment differs from that used in patients with primary or secondary hyperparathyroidism. Although primary hyperparathyroidism occurs sporadically, the familial disorders can occur with relatively high penetrance (approaching 95% in multiple endocrine neoplasia, type 1 [MEN1]). The following facts originated in 2 landmark articles on the subject of familial and hereditary hyperparathyroid disorders. These articles contain many more details about these conditions, but the extensive discussion has been summarized below for easy reference. Stephen Marx, MD, of the National Institutes of Health (NIH) presented a detailed analysis of hereditary hyperparathyroidism disorders at a symposium on parathyroid disorders sponsored by the New York Head and Neck Society in March of 2005. Mutations of CASR (calcium receptor set gene) play a major role in ADMH, FHH, and NSHPT. CASR alters parathyroid sensitivity to elevated serum calcium levels and alters the serum calcium set level. The mutation of the CASR gene occurs at its cytoplasmic tail. The phenotypic features include hypercalcemia, elevated parathyroid hormone and magnesium levels, relative hypercalcuria and often nephrolithiasis or nephrocalcinosis. FHH is the syndrome with the mildest manifestations of the mutation. Although persons with FHH are hypercalcemic at birth, their urinary calcium level is normal, and little long-term morbidity develops. Parathyroidectomy is generally not indicated. However, persons with familial hyperparathyroid syndromes who have mutations of the CASR gene (ie, NSHPT) may require radical total or subtotal parathyroidectomy. In hyperparathyroidism, the release of excess PTH primarily causes hypercalcemia because of its direct effect on receptors in bone, the intestine, and the kidneys. Elevated ionized serum calcium levels suppress PTH production in the physiologic state. This negative feedback loop is inactive in the presence of an adenoma or glandular hyperplasia; therefore, PTH hypersecretion continues in the presence of hypercalcemia. Resorption of calcium from bone and increased absorption from the gut are direct effects of elevated PTH levels. In nonhyperparathyroid hypercalcemia such as paraneoplastic syndromes, compensatory renal and intestinal loss of calcium occurs. This compensation is inoperative in the presence of elevated PTH levels, compounding the hypercalcemic state. As the serum calcium level approaches 12 mg/dL, renal tubular reabsorption of calcium is exceeded and hypercalciuria develops. Although this is of some aid in reducing serum calcium levels, the incidence of nephrolithiasis and nephrocalcinosis increases, which may eventually lead to reduced creatinine clearance and renal failure. Excess extracellular calcium may be deposited in the soft tissues, causing painful calcified nodules in skin, subcutaneous tissue, tendons (calcific tendonitis), and cartilage (chondrocalcinosis). Vitamin D plays an important role in calcium metabolism because its presence is required for the actions of PTH on its target organs. Body stores of vitamin D may rapidly become exhausted in the hyperparathyroid state, which may reduce the level of circulating calcium. Vitamin D metabolism is disrupted further in chronic renal disease, which inhibits calcium absorption from the GI tract. Progressive depletion of calcium from bone by PTH and the reduced GI absorption from the gut lead to osteomalacia and advanced osteitis fibrosa cystica, which is rarely seen today. The role of serum and urinary phosphate is also important. PTH decreases renal tubular reabsorption and increased secretion of phosphate, leading to hyperphosphaturia and decreased serum phosphate levels. Hypophosphatemia can worsen the hypercalcemia by increasing the production of the active form of vitamin D in the kidney. Currently, a routine blood analysis that detects an elevation of serum calcium levels identifies most cases of primary hyperparathyroidism. (Serum calcium levels were first measured in 1909.) These patients are, for the most part, asymptomatic or may have vague nonspecific symptoms such as weakness and fatigue. When the disease is detected late in its course, the related signs and symptoms are directly attributed to hypercalcemia, increased urinary calcium levels or bone changes, and, specifically, osteitis fibrosa cystica (now rare). In 1957, Walter St Goer first described the mnemonic to note the triad of "stones, bones, and abdominal groans" in persons with hyperparathyroidism. Today's mnemonic may be better stated as "stones, bones, groans and psychological overtones". Prior to the 1970s, the diagnosis was most often made based on the presentation of bone disease and other late manifestations. In addition, since many patients with primary hyperparathyroidism are postmenopausal females, it has been suggested that estrogen deficiency may play a role in unmasking hypercalcemia. Renal (secondary) hyperparathyroidism develops in patients with chronic renal disease and dramatic elevations of the PTH level (usually >1000 pg/mL and, at times, >3500 pg/mL), normal or low serum calcium levels, marked bone demineralization related to renal osteodystrophy, soft tissue calcifications, and intense pruritus. These patients may experience severe bone and joint pain and painful calcifications in soft tissue and tendons. Serum phosphate levels rise in these patients as calcium levels drop, a potent stimulus for PTH production. The renal disease inhibits renal production of vitamin D. Aluminum can reach toxic levels in bone if it is present in the dialysate, compounding the osteomalacia and further stimulating PTH production. Tertiary hyperparathyroidism presents similarly to secondary hyperparathyroidism, with pain and PTH elevations in patients who have had near-total parathyroidectomy in the past. The remaining gland may begin to function autonomously after parathyroidectomy. Progressive hyperphosphatemia of renal disease stimulates PTH, which causes hypercalcemia. Parathyroid carcinoma is rare (0.1-1%) and often presents with serum calcium levels greater than 14 mg/dL, markedly elevated serum PTH levels, and a palpable mass in the neck, which is semifixed to the adjacent neck structures. The palpable mass is the major sign that suggests the preoperative diagnosis. Cystic parathyroid adenoma may also present as a palpable neck mass and is diagnosed by ultrasound and needle aspiration of the fluid, which reveals extremely high PTH levels. In the past, when hyperparathyroidism was discovered in an advanced state, significant bone disease was usually present. Prior to 1932, all patients with hyperparathyroidism had osteitis fibrosa cystica, the hallmark of the disease. For the subsequent 30 years, renal stones were the most common finding. In that era, brown tumors, osteoclastomas, and bone cysts were frequently seen. Subperiosteal bone resorption was often observed radiographically. In 1937, Albright described jawbone manifestations of hyperparathyroidism, which include fibrous osseous dysplasia, cystic bone lesions, and giant cell lesions. Hyperparathyroidism has been demonstrated to occur in 5-10% of patients with fibrous dysplasia. Surgery is also indicated for patients who are not expected to comply with periodic follow-up appointments, who find retesting inconvenient, and who request surgery. Surgery is also the treatment of choice in younger persons (< 50 y) because of the potential risk of bone demineralization over ensuing decades. Parathyroidectomy is indicated in the presence of such manifestations of hyperparathyroidism as stones and bone disease, pancreatitis, peptic ulcer, muscle weakness, fatigue and changes in mental status. Surgery is also indicated when the serum calcium level exceeds 11.4 mg/dL. However, even patients with early asymptomatic hyperparathyroidism who have minimally elevated serum calcium levels can obtain metabolic benefit from early surgical intervention. Currently, most cases of primary hyperparathyroidism are discovered during routine screening, and the individuals are relatively asymptomatic; serum calcium levels may be mildly elevated (10-11.5 mg/dL), depending on the serum albumin levels. Upon further questioning, these patients often admit to fatigue and muscle weakness or pain in bones or joints. Early surgery in these patients is indicated if they develop progressive hypercalcemia, renal calculi, or osteitis fibrosa. Indications for parathyroidectomy in patients with renal (secondary) hyperparathyroidism are bone pain, intractable pruritus, soft tissue calcifications, and, occasionally, calciphylaxis in the presence of elevated PTH and serum calcium levels. In most patients, whether to perform subtotal or total parathyroidectomy with reimplantation depends on the comfort level of the nephrologist who manages the postoperative hypoparathyroidism. Indications for surgery in patients with tertiary hyperparathyroidism are the same as for those with secondary hyperparathyroidism; however, since subtotal parathyroidectomy was already performed, completion parathyroidectomy is necessary. In most patients with primary hyperparathyroidism, the surgical procedure, in experienced hands, should be straightforward, uncomplicated, and swift. If the adenoma has been localized preoperatively, the appropriate quadrant is explored and the specimen removed. Frozen section can be requested if necessary. A detailed knowledge of the embryology of parathyroid glands is helpful when only 3 normal glands have been found and the pathologic gland has not been located. The development of the parathyroid glands and thymus gland is specifically related to the embryology of the third and fourth branchial arches. Since the 2 inferior parathyroid glands are derived from the third branchial arch, they are pulled caudally with the migrating thymus in the fifth week of development and may descend into the mediastinum. If an adenoma is suspected in a lower gland that has not been found, it is probably located in the superior mediastinum or thymus. Occasionally, the lower gland can be located as low as the aortic arch. Parathyroid adenomas occur in the inferior glands twice as often as in the superior glands. The location of the superior parathyroid glands is more variable. At times, they can even be located inferior to the inferior glands and have been identified in locations between the skull base and the aortopulmonary window in the posterior mediastinum. A missing superior gland, derived from the fourth branchial arch, is embryologically related to the cricothyroid muscle, pharyngeal constrictors, and superior laryngeal nerve, since the superior gland is embryologically located in the wall of the pharynx. Since the fourth arch vessel is the common carotid artery, the ectopic superior gland may be located in the retroesophageal space, posterior mediastinum, or retropharyngeal areas (if still attached to the pharynx) or within the carotid sheath. This knowledge is also useful when 4 normal glands have been identified and the adenoma remains at large, necessitating exploration of an ectopic site to locate the missing adenoma. It may also be located within the posterior thyroid capsule or the parenchyma of the thyroid lobe, requiring hemithyroidectomy. In straightforward cases, an inferior adenoma is quickly identified relatively superficially in the space just lateral to the veins at the inferior thyroid pole. The most common location of the inferior gland is caudal to the inferior thyroid artery (ITA) and medial and anterior to the recurrent laryngeal nerve (RLN). The superior gland is typically located on the undersurface of the thyroid lobe superior to the ITA and lateral to the plane of the RLN. Surgery is complex and may be contraindicated in patients with certain familial parathyroid disorders. Carney JA. The glandulae parathyroideae of Ivar Sandström. Contributions from two continents. Am J Surg Pathol. 1996 Sep. 20(9):1123-44. [Medline]. Mandl F. Klinisches und experimenteles zur fraga der lakalisierten und generalisiereten osteitis fibrosa. Arch Klin Chir. 1926. 142. Albright F, Aub J, Bauer W. Hyperparathyroidism: A common and polymorphic condition as illustrated by 17 cases from one clinic. JAMA. 1934. 102:1276. Akhaliia MG, Meladze GD, Dzhgamadze ShV, Kakiashvili MS, Gotsiridze GSh. [New method of determining the pathophysiological changes in the pleural exudate for the diagnosis of postoperative complications]. Grudn Khir. 1975 Nov-Dec. 58-63. [Medline]. Yamamoto T, Tominaga Y, Okada M, et al. Characteristics of Persistent Hyperparathyroidism After Renal Transplantation. World J Surg. 2015 Nov 6. [Medline]. Carling T, Udelsman R. Parathyroid surgery in familial hyperparathyroid disorders. J Intern Med. 2005 Jan. 257(1):27-37. [Medline]. Hu S, Cai X, Mewani V, Trooskin S, Wang X. Impact of ethnic background on clinical characteristics and cardiovascular risk factors among patients with primary hyperparathyroidism. Endocr Pract. 2015 Nov 4. [Medline]. Maruani G, Hertig A, Paillard M, Houillier P. Normocalcemic primary hyperparathyroidism: evidence for a generalized target-tissue resistance to parathyroid hormone. J Clin Endocrinol Metab. 2003 Oct. 88(10):4641-8. [Medline]. Harrison P. Surgery Better Than Cinacalcet for Hyperparathyroidism. Medscape Medical News. Jun 16, 2015. [Full Text]. Isaacks RE, Harkness DR, Froeman GA, Sussman SA. Studies on avian erythrocyte metabolism--I. Procedure for separation and quantitation of the major phosphorylated metabolic intermediates by anion exchange chromatography. Comp Biochem Physiol A Comp Physiol. 1976 Jan. 53(1):95-9. [Medline]. Vasher M, Goodman A, Politz D, Norman J. Postoperative calcium requirements in 6,000 patients undergoing outpatient parathyroidectomy: easily avoiding symptomatic hypocalcemia. J Am Coll Surg. 2010 Jul. 211(1):49-54. [Medline]. Norman J, Politz D. Prospective Study in 3,000 Consecutive Parathyroid Operations Demonstrates 18 Objective Factors that Influence the Decision for Unilateral versus Bilateral Surgical Approach. jamcollsurg. aug/2010. 211 2:1072-7515/10. Dogan R, Kara M, Yazicioglu A, Kaynaroglu V. The use of gamma probe for the intraoperative localization of an ectopic parathyroid adenoma. Tuberk Toraks. 2009. 57(2):208-11. [Medline]. Tolley N, Arora A, Palazzo F, et al. Robotic-assisted parathyroidectomy: a feasibility study. Otolaryngol Head Neck Surg. 2011 Jun. 144(6):859-66. [Medline]. Albright F. Page out of the history of hyperparathyroidism. J Clin Endocrinol. 1948. 8:637. Albright F, Butler A, Hampton A. Syndrome characterized by osteitis fibrosa disseminata, areas of pigmentation and endocrine dysfunction, with precocious puberty in females. N Engl J Med. 1937. 216:727-746. B. Dijkstra, C. Healy, L.M. Kelly, E.W. McDermott, A.D.K. Hill, N. O'Higgins. Clinical review: Parathyroid Localization-current practice. J.R.Coll.Edinb. Aug 2002. 47:599-607. Brenner BM, Rector FC. Brenner & Rector's The Kidney. 5th ed. Philadelphia:. WB Saunders Co. 1996. Cecil RL, Bennett JC, Plum F. Cecil Textbook of Medicine. 20th ed. Philadelphia: WB Saunders Co. 1996. Cecil RL, Smith LH, Wyngaarden JB. Cecil Review of General Internal Medicine. 3rd ed. Philadelphia: WB Saunders Co. 1985. Clark O. Endocrine surgery of the thyroid and parathyroid glands. In: Endocrine Surgery. 1985. Díaz-Aguirregoitia FJ, Emparan C, Gaztambide S, Aniel-Quiroga MA, Busturia MA, Vázquez JA, et al. Intraoperative monitoring of kinetic total serum calcium levels in primary hyperparathyroidism surgery. J Am Coll Surg. 2004 Apr. 198(4):519-24. [Medline]. Ehrig U, Wilson DR. Fibrous dysplasia of bone and primary hyperparathyroidism. Ann Intern Med. 1972 Aug. 77(2):234-8. [Medline]. Fraker DL, Travis WD, Merendino JJ Jr, et al. Locally recurrent parathyroid neoplasms as a cause for recurrent and persistent primary hyperparathyroidism. Ann Surg. 1991 Jan. 213(1):58-65. [Medline]. Gates G. Current Therapy in Otolaryngology-Head and Neck Surgery. 5th ed. Mosby-Year Book. 1990. Greenberg CC, Regenbogen SE, Studdert DM, et al. Patterns of communication breakdowns resulting in injury to surgical patients. J Am Coll Surg. 2007 Apr. 204(4):533-40. [Medline]. Kellett HA, MacLaren IF, Toft AD. Gout and pseudogout precipitated by parathyroidectomy. Scott Med J. 1982 Jul. 27(3):250-1. [Medline]. LaBagnara J Jr, Yuppa F, Klein MH. Fibrous dysplasia of the middle turbinate with primary hyperparathyroidism. Ear Nose Throat J. 1998 Jul. 77(7):552-3. [Medline]. Lairmore TC, Howe JR, Korte JA, et al. Familial medullary thyroid carcinoma and multiple endocrine neoplasia type 2B map to the same region of chromosome 10 as multiple endocrine neoplasia type 2A. Genomics. 1991 Jan. 9(1):181-92. [Medline]. Larsson C, Skogseid B, Oberg K, et al. Multiple endocrine neoplasia type 1 gene maps to chromosome 11 and is lost in insulinoma. Nature. 1988 Mar 3. 332(6159):85-7. [Medline]. Marx SJ, Simonds WF, Agarwal SK, et al. Hyperparathyroidism in hereditary Syndromes: special expressions and special managements. J Bone Miner Res. 2002 Nov. 17 Suppl 2:N37-43. [Medline]. Marx SJ, Spiegel AM, Levine MA, et al. Familial hypocalciuric hypercalcemia: the relation to primary parathyroid hyperplasia. N Engl J Med. 1982 Aug 12. 307(7):416-26. [Medline]. McBiles M, Lambert AT, Cote MG, Kim SY. Sestamibi parathyroid imaging. Semin Nucl Med. 1995 Jul. 25(3):221-34. [Medline]. Mehta NY, Ruda JM, Kapadia S, Boyer PJ, Hollenbeak CS, Stack BC Jr. Relationship of technetium Tc 99m sestamibi scans to histopathological features of hyperfunctioning parathyroid tissue. Arch Otolaryngol Head Neck Surg. 2005 Jun. 131(6):493-8. [Medline]. Norman J, Aronson K. Outpatient parathyroid surgery and the differences seen in the morbidly obese. Otolaryngol Head Neck Surg. 2007 Feb. 136(2):282-6. [Medline]. Pattou F, Huglo D, Proye C. Radionuclide scanning in parathyroid diseases. Br J Surg. 1998 Dec. 85(12):1605-16. [Medline]. Prekeges JL, Eisenberg B. Parathyroid scintigraphy. J Nucl Med Technol. 1997 Mar. 25(1):59-65. [Medline]. Rogers H. Primary hyperparathyroidism and hyperplasia of parathyroid glands associated with duodenal ulcer: report of an additional case with special reference to metabolic, gastrointestinal and vascular manifestations. Arch Int Med. 1947. 79:3-7. Schwartz SI. Principles of Surgery. 7th ed. McGraw-Hill. 1999. Soon PS, Yeh MW, Sywak MS, Roach P, Delbridge LW, Sidhu SB. Minimally invasive parathyroidectomy using the lateral focused miniincision approach: Is there a learning curve for surgeons experienced in the open procedure?. J Am Coll Surg. 2007 Jan. 204(1):91-5. [Medline].